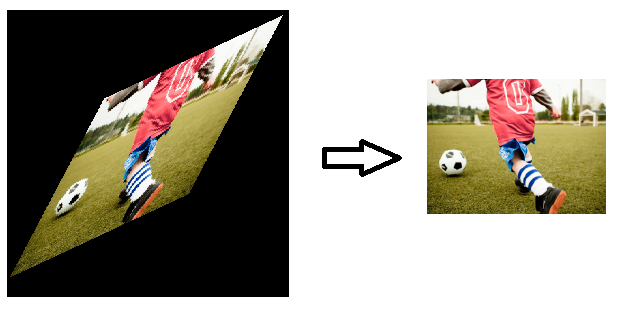 After Nokia Imaging SDK graduates from beta, custom filter introduced. This is most exciting feature, that allow us to create our own filters. In this article, I'll be explaining how to implement custom filters for different purposes by comparing differences in implemantation that described in Core Concepts document. Sample Filters are implemented for my framework which is described in "Filter and Custom Filter Management Framework for The Nokia Imaging SDK". So that some of complex filters may not be working well without my framework. But it's simple to fix, I'll be explaining in the article. How to implement custom filters? I'm categorizing my sample custom filters in 3 category; calculation purpose, simple ones and complex ones. I'll try to explain over sample filters. HistogramFilter is the only sample for this type of filter. This filters calculates Red, Green, Blue and Luminance of image. These parameters can be used as filter parameters then. Trick is here, IsInPlace property in base constructor is set to true, so that no need to set targetPixelRegion.ImagePixels. IsInPlace property is true here. Which means sourcePixel and targetPixel is same array. Documentation says that it's more efficient. But you have to be careful if you want to process pixel and don't want to change source pixel. IsInPlace property didn't set here. Default value of it is false. Which means sourcePixel, targetPixel is different array and you have to get pixel from sourcePixel, process it and set to targetPixel. Also note that If you don't set targetPixel, you'll see black image. 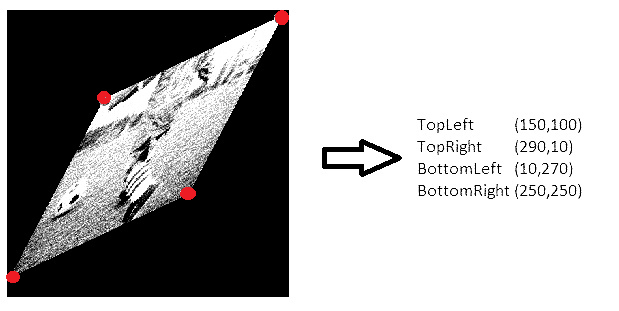 PixelInterpolation is one of the sample for this type of filter. This filter pixelates image without changing the image size. It divides to image to rectangles like table and get top left pixel of each cell. Then changes every pixels in cell to corner. For that purpose, iteration every pixels with ForEachRow is not efficient. First of all, use following to get width and height of an image. Then, it iterates only corner pixels. ForEachRow method in PixelRegion class used for iterate over the pixels consecutively. If you want to iterate every pixels consecutively, don't use for loop, ForEachRow method is the most efficient way. Unless you want to iterate some pixels, not all of them or multiple iteration for each pixel as shown in the code above, use for loop. QuadTransformation filter is transforms quadratic shape to rectangular form. As you seen in the image, result will be smaller than input image. But custom filter implementation doesn't allow us to change output size. I solved that problem in my framework by using IPreProcess and IPostProcess interfaces. With this implemantation, after QuadTranformation processed, ReframingFilter applied to image. To use this custom filter without my framework, you've to build pipeline between QuadTranformation and ReframingFilter as below.The result will be the as same as with using my framework. Histogram filter doesn't render image, it's for calculation purpose. As you've seen in article, it's easy to implement your own custom filters. I implemented some filters which are used for image processing and I'll constantly adding new filters for that purpose. If you request me a custom filter implementation, please add a comment. I'll try my best and also you can contribute to project, follow github page.